It’s week 13 of the 2019 Legislative Session and the legislature is quickly approaching fiscal committee cutoff in the opposite house. After bills pass through their house-of-origin, they move to the opposite chamber for consideration. Bills must move to the floor of the opposite house for consideration by 5 p.m. today to remain alive. To view the legislative session cutoff calendar, click here. House and Senate leadership have released their 2019-21 state biennial operating and capital budget proposals. For details of the proposals, check out the budget brief prepared by the UW’s Office of Planning and Budgeting. These proposals follow the release of the Governor’s budget proposals in December. Legislators from both chambers will begin negotiating compromise operating and capital budgets soon. The budgets must be finalized by the end of the 2019 legislative session, which is currently scheduled for Apr. 28. President Ana Mari Cauce visited Olympia yesterday, Apr. 8, to meet with House and Senate leaders and budget writers. During her meetings, she discussed the budget proposals and advocated for critical foundational support for the UW. She also spoke with ASUW students in town for their legislative advocacy day. They connected on their mutual priority of access and affordability in higher education. 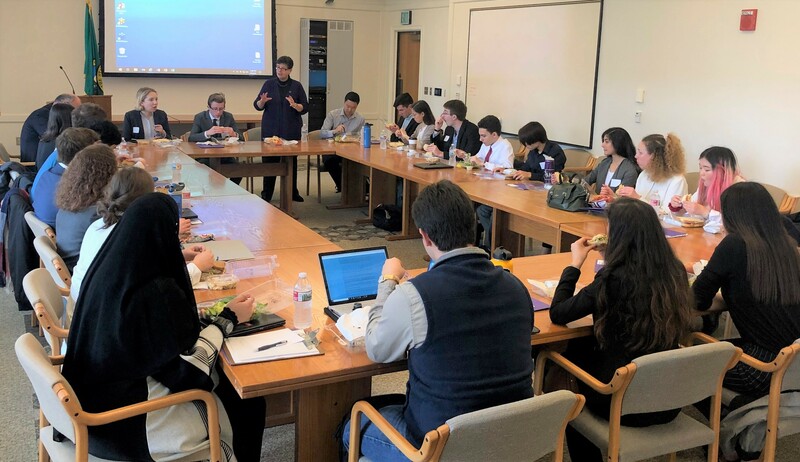 Discussions specifically focused on the commitment lawmakers made to fully fund the State Need Grant (being rebranded as the Washington Promise Scholarship) and the importance of that funding for low-income students. President Cauce’s passionate advocacy is essential to the legislative success of the UW. Thank you, President Cauce! The UW Provost, Mark Richards, and Regents traveled to Olympia on Mar. 26 to meet with leaders and legislators in both the House and Senate. During these meetings, they championed the priorities outlined in the UW’s legislative agenda and asked lawmakers for their support. They also demonstrated the importance of higher education to our state’s residents and economy. Thank you, Provost Richards and Regents! The UW is very fortunate to have such strong and committed leaders. Dr. Gary Stobbe participated in a work session in the House Human Services and Early Learning Committee on developmental disabilities on Mar. 27. His brief focused on the need to provide higher quality and more accessible care for people with autism. His research and hands-on experience informed his policy and funding recommendations to the committee. On Apr. 1, Dr. Beatriz Carlini and Dr. Nephi Stella made a presentation to the House Commerce and Gaming Committee as experts on cannabidiol (CBD). Their presentation included relevant, in-depth scientific information and studies related to CBD. They also focused on the continuing barriers to this important research. That same day, Dr. Jacob Vigdor presented before the Senate Committee on Housing Stability & Affordability during a work session on rent control. Dr. Vigdor’s presentation provided a brief history of rent control practices in Washington State and across the nation. He also presented an objective look at the use of rent control or rent stabilization in other parts of the nation. The UW’s experts fielded questions and provided legislators with valuable information that will help inform policy decisions in the future.